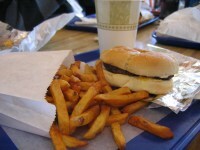 ﻿﻿﻿I’ve read many favourable reviews for the Great Burger & Fry Co (GBF) but this was my first visit. In a nutshell – GBF is good and cheap! It seems most of the good burger joints are counter service or take-out only. GBF is counter service with all the ambience of a recycled donut shop. So far we’ve only received table service at Original Georges.The booths were comfortable and roomy enough and all eight of us were able to sit together. The GBF cash register-person took our orders quickly, but apparently their grill can only handle one or two burgers at a time so our burgers came out in a parade - still pretty quick though. 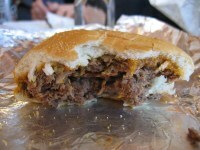 Like Daly Burger, there were no plates for dine-in and you had to eat off the foil and paper wrapper. Word of BurgerClub is spreading and this week we were joined by two visiting burger dignitaries - AngelFreak and CaptainConquest. There are 100’s of people clamoring to get into to BurgerClub so we’ve had to limit the team to people with funny names. 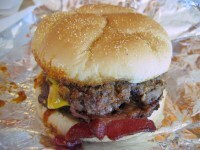 I had my usual Bacon-Double-Cheeseburger and quite enjoyed it. I’m having a hard time being critical of the burgers we’re evaluating - I really like eating hamburgers and feel bad saying anything mean about them. The BurgerClub started with some of Winnipeg’s best burger joints, so maybe we'll visit one of the big-four burger chains to be reminded of what a low-end burger tastes like. ﻿﻿﻿﻿﻿Some other comments were that the fries were quite stubby in stature and the milkshake was very small. 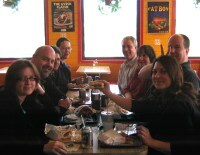 The Fatboy’s were a bit messy (not messy enough according to one diner) and the cheeseburger was quite plain. The restaurant charges an Interac fee and they don’t take credit cards so cash is king at GBF! I live in East Kildonan, and I was turned on to GBF by a co-worker who was amused by my distaste of big chain crappy burgers. I was not disappointed, I love their Double Fat Boy combo. You lay the fries down on the foil burger wrapper, and let the extra chili from the burger drip on the fries. Deelish. They now take credit card. But is super slow dial up so might not be the best during busy hours.